I have been wanting to make a carrot cake for ages! They are just so delicious! It’s such a soft cake, that’s great with chunky nuts and spices. And of course it’s all made 10 times better with the cream cheese icing! I’m going to be honest with you, the carrot cake I have made for you today isn’t the best carrot cake I’ve ever had but it’s up there! I’m yet to discover the secret to making the best carrot cake 🙂 I’m still working on it. Preheat the oven to 180°C. Grease and line a 23cm x 13cm loaf tin with baking paper. Place the sugar and oil in a standing mixer fitted with the paddle attachment and mix on low-medium speed for 2-3 minutes. Add the eggs one at a time and beat well after each addition. Remove bowl from mixer and sift the flour, bicarb soda, baking powder and spices into the mixture and fold in until just combined. Add the carrot and nuts and fold in until just incorporated. Pour mixture into prepared tin and bake for 55-60 minutes or until cooked when tested with a skewer. Cool cake in tin. For the icing, process the cream cheese in a food processor fitted with the paddle attachment until smooth. Sift in the icing sugar and add the lemon juice and process until smooth. 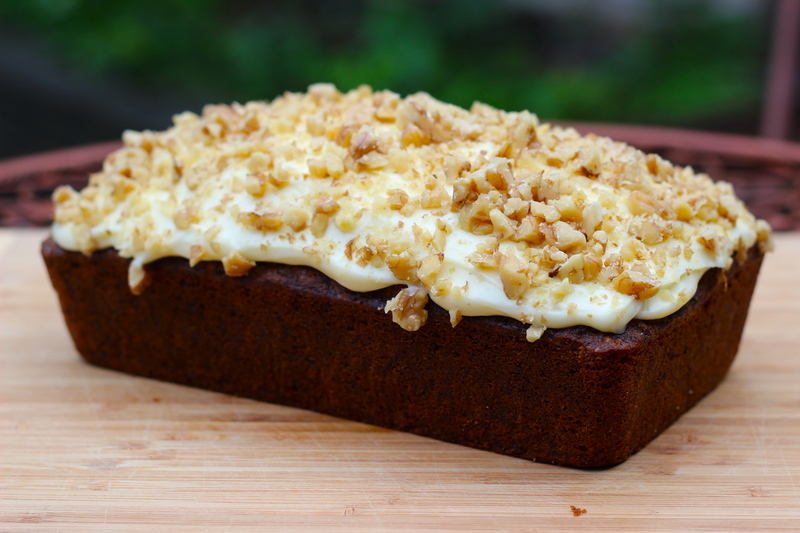 Spread the icing on the top of the cooled cake and sprinkle with extra chopped walnuts. The blog looks wonderful Mel. Your passion for this type of cooking is inspiring. I am very proud of you and impressed by your hard work.